SACRAMENTO, Calif. /California Newswire/ — Beauty pageants are sometimes criticized for being overly competitive, cut throat and an advantage to the wealthy due to high costs of preparing for and participating in the pageant, says Stephanie Farrell of Miss Greater Bay Area, Calif. California's state pageant, owned and operated by Top 10 Productions of Southern California, works with several independent regional directors who host preliminary pageants that qualify contestants for the Miss California USA(R) and Miss California Teen USA(R) pageants. The 2016 state pageant will be held in Long Beach, California from December 4-6, 2015. 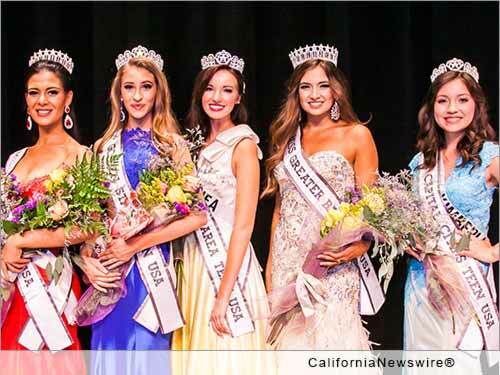 Northern California Regional Director, Stephanie Farrell, is working to debunk what she calls a myth about pageants as she helps advance nine northern California women who are running for 2016 Miss California USA(R) and Miss California Teen USA(R). Farrell explains that young ladies join pageants because participation helps achieve their professional goals and gives them local, statewide, national and sometimes international exposure. Farrell's aim is to help all young ladies who wish to be involved get a fair opportunity to properly prepare for this event. "I try to make it so that all our ladies – regardless of funding – can be well prepared to compete for these coveted titles," Farrell said. "I believe that the experience is much more than winning a crown. I mentor young ladies to gain an experience of not only self-empowerment, but also to help each other. We want our ladies to understand team work and sisterhood. It is important they experience the satisfaction of not only working on their own beauty, but also of helping others to improve and be their best. This, in turn, makes them stronger and more confident women." To that end, Farrell is holding a "Crown Diva Boot Camp" event in the Bay Area, where all contestants get an opportunity to receive professional coaching from a "Pageant Boutique & Pageant Academy" owned and operated by Crown Diva of Santa Monica, Calif. Famous for an impressive history of coaching pageant winners, Crown Diva Owner Kristen Bradford has personally trained a Miss USA, Miss California USA and several other state and local winners from various systems. "The key to doing well in any pageant system is preparation," her website reads. The Crown Diva training program is designed to help contestants take their performance to the next level and bring home the crown. Contestants will be coached interviewing and answering questions, walking in high heels, maintaining composure while on stage in a swimsuit and evening gown, tips on their best colors, makeup and hair styling, fitness and nutrition, and exuding beauty and confidence. However, Farrell's approach goes beyond these technical aspects of pageant preparation. Farrell has recruited two local businesses to help make the pageant preparation experience much more meaningful for all her candidates. On Saturday evening November 21, 2015, between 7 to 9 p.m., Black Bear Diner of Pleasanton will host eight northern California beauties where they will have the opportunity to meet restaurant guests, answer pageant-type interview questions asked from guests, and gain a real experience endorsing a product. Each lady will endorse an entree from Black Bear Diner's "Fit & Focused" menu. Black Bear will be offering a 20 percent discount for all Fit & Focused meals that are ordered during the hours of 7 to 9 p.m. on this evening. This will allow each lady to practice extemporaneous presentation in front of the public, and give them experience endorsing a product. Farrell says this experience is so valuable because the winners of the Miss California USA(R) and Miss California Teen USA(R) pageants will be hired to promote all aspects of California, and their journey will include endorsing many businesses and organizations within the state. Later that night, Pleasanton's Doubletree Hilton Hotel is graciously sponsoring rooms, where the ladies will spend the night to further bond and prepare for their pageant. Northern California's Miss California USA(R) candidates are Jayne Geist, Miss Greater Bay Area USA(R); Domonique Jones, Miss Capital Cities USA(R); Nancy Wang, Miss Golden Gate USA(R); Ronae Wells, Miss Greater Sacramento USA(R); and Sofia Hanan, Miss Golden State USA(R). The Miss California Teen USA(R) candidates are Alexis Aguila, Miss Greater Sacramento Teen USA(R); Brooklyn Lowrey, Miss Golden State Teen USA(R), Kimberli Bautista, Miss Capital Cities Teen USA(R); and Linnea Visbal, Miss Greater Bay Area Teen USA(R). The producers of the Miss California USA(R) and Miss California Teen USA(R) pageants is San Diego based Top 10 Productions, Inc. The winner of MISS CALIFORNIA USA(R) will go on to compete at the national MISS USA(R) competition which is televised live on FOX. The winner of Miss California Teen USA(R) will go on to compete at Miss teen USA(R). More information: https://www.facebook.com/MissGreaterBayAreaPageant/ and https://misscausapageant.com/.